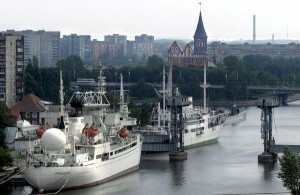 (FILES) This picture taken on July 25, 2002 shows one of the terminals of Kaliningrad (former Koenigsberg) sea port with Koenigsberg Cathedral in the background. The Russian enclave of Kaliningrad, about half the size of Belgium, is separated from the rest of Russia by Poland and Lithuania. Founded in 1255, once the home of the kings of Prussia and forever associated with the 18th-century philosopher Immanuel Kant, Kaliningrad is home to around one million people comprising 80 nationalities, although the Russian community (80 percent) is by far the largest. The territory’s effective separation from Russia dates back to the break-up of the Soviet Union in 1991. 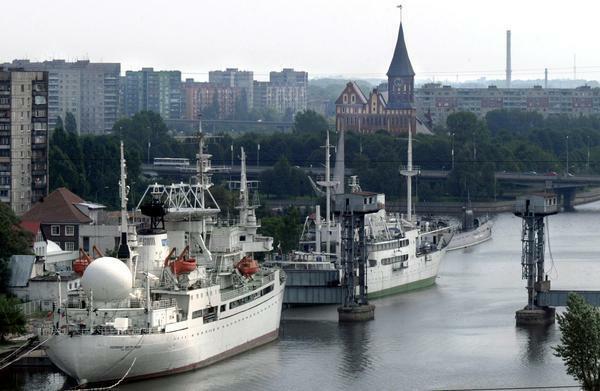 As a key military installation on the Baltic, the city and the port were closed off to non-Soviet citizens until 1991. In 1992 it became a free-trade zone, and in 1996 a special economic zone, acquiring privileges with relation to foreign investors. The enclave retains its strategic importance, both as the port for Russian missile-equipped submarines and as a base for the 11th army.